Maggie sampled new Islington eatery Chinese Laundry, casting her expert eye (and tastebuds) over the authentic Chinese cuisine served up in the tiny, 80s-inspired restaurant. 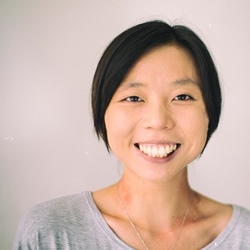 Maggie blends her Hong Kong heritage with a foodie life in London as Designer and front end developer for Great British Chefs. Whilst still in its dusty decorating and drilling stages, walking past this rather quaint-looking restaurant I had thought, judging by the name, that it literally was a ‘Chinese laundry’. I’ll be honest though, I didn’t really understand why a laundry business would choose being Chinese as a major selling point or what that implied . 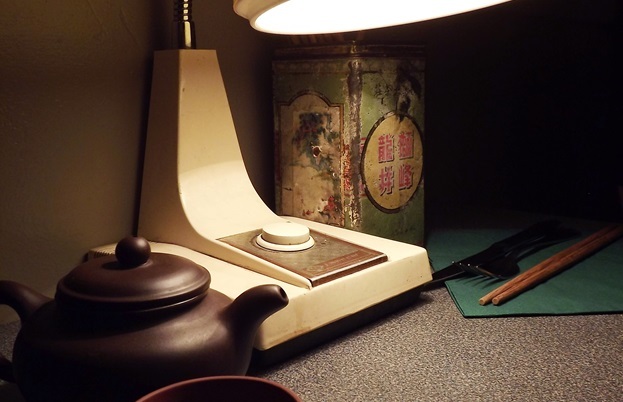 . . Fortunately, it turned out to be an 80s-style Chinese restaurant with the full package of dim lighting, tiled floors, retro mirrors, antique wallpaper and an abundance of friendly staff creating an intimate and nostalgic atmosphere. Starting with the drinks, there was a good range with a cocktail menu filled with interesting names such as ‘Drunken Concubine’ and ‘Silk Road Nowhere’, with equally interesting ingredients including Mei Kuei Baiju and infused Lapsang tea. I chose a green tea, as I have always felt that a Chinese dinner is best matched with tea because it cuts through the slight greasiness of the food and stops the meal from being too heavy (although this could, of course, be because I fall into the category of someone whose eyes are greedier than their stomachs). I am only an amateur when it comes to tea knowledge, but I did visit a tea farm in China once and learnt a little about the tea leaves. The green tea served at Chinese Laundry had a bitter edge with a slightly sweet lingering aftertaste, which I think is an indication of good tea. 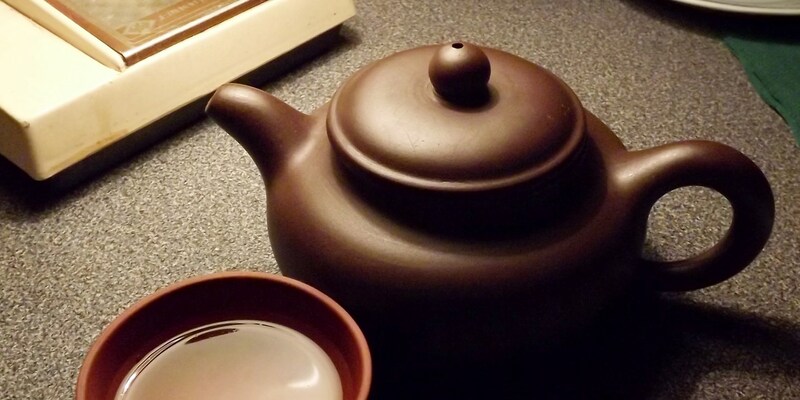 The small teapot was also made of Yixing clay, which is a traditional material for brewing tea that aids the release of flavours from the tea leaves. Being Cantonese myself, and having a wonderful mother that always believed children should be given three proper home-cooked meals every day, I have grown up to be rather picky when it comes to Chinese food, and tend to favour not eating the cuisine when I dine out. However, the moment the first dish came out, all my senses perked up and I found myself quivering a little with excitement. I chose the Pork belly with preserved vegetables – a dish my mother regularly cooks – the Century eggs and soft tofu, Sweet basil fried chicken and the Pumpkin, broccoli and green peas coated with salted duck egg yolk. Although all delicious sounding dishes, they were slightly strategic choices as I felt they were dishes that would best showcase the restaurant’s grasp of authentic techniques and ingredients. 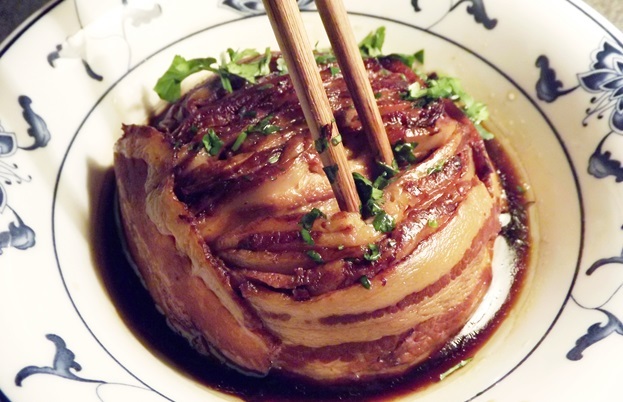 The pork belly might not be the most difficult dish to make, but it’s nevertheless a tricky recipe to master as it’s a common home comfort food for most Chinese individuals. From years of listening to my mother complain about her own mui choy kau yok (the Cantonese name) and with many of my own failed attempts at the dish, I have narrowed down the key success factors to choosing the right cut of pork belly and the careful selection and washing of the preserved vegetables. The pork belly should be packed with flavour and virtually melt in your mouth, and the preserved vegetables should be cleaned thoroughly but not end up being over-diluted in the washing process. The perfect rendition of this dish should make you crave rice, like curry does. Although I started off a little sceptical, the moment the smell of the pork reached my suddenly expectant senses, I found my mouth watering. You could see that the pork belly was the perfect ratio of fat to meat – this dish does not work with lean meat, so there’s no point substituting it because of worries over cholesterols and diets. The fat of the pork belly melted beautifully in the mouth, although the meat had more of a shredded texture, and I felt the preserved vegetables were a little lost in the overall dish. Saying that though, after eating my way through the rest of the dishes, I think the chef seemed to prefer cooking with subtle flavours that slowly emerged as you ate. A little bit like a shy friend, not necessarily the most exciting but with their own quietly comforting qualities. Next up, was the Century eggs and soft tofu. Before you completely write off ‘century eggs’ as some weird tradition, or a hundred-year-old rotten disaster that will evoke various terrible digestive reactions, the literal Chinese translation is actually ‘skin egg’, and it is simply duck, chicken or quail eggs preserved in a saline solution that typically consists of clay and salt, or alternatively ash, quicklime and rice hulls. These can be preserved for anything from a few weeks to a few months, during which time the yolk turns a greyish colour and is stronger and richer in flavour compared to normal eggs, while the white turns a translucent, almost black, hue. The tofu was smooth and light in taste, contrary to the normal strong soy taste of tofu, leaving me wondering if it wasn’t pure tofu and actually a mixture, which makes it easier to obtain a silkier texture. The lighter taste also worked in harmony with the tangy spiciness of the sauce and richness of the century eggs. It was a refreshing dish that reminded me of the food I’ve had previously in Hunan, a province known for specialising in spicy food. 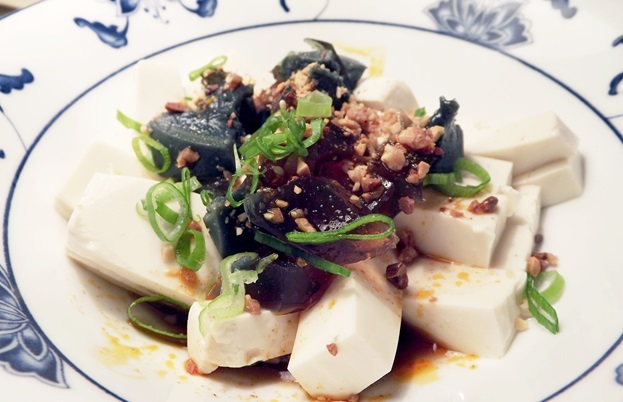 The pieces of century egg and tofu were cut to perfect sizes that were not too bitsy and easy to pick up with chopsticks. 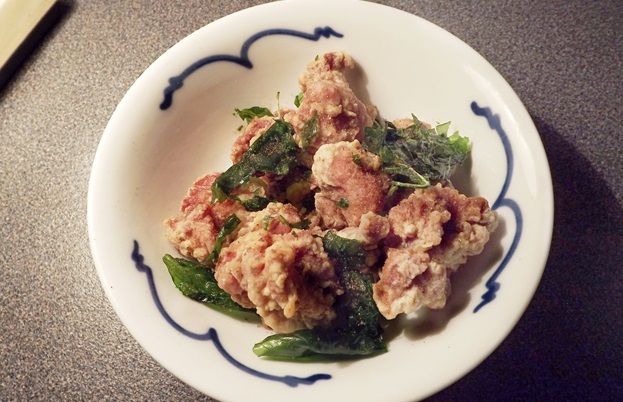 Following this was the star dish for me, the Sweet basil fried chicken. Perfectly fried with a crispy, but not hard, exterior, it was also not too oily. First, there was the hit from the warm and addictive smell of the pepper salt, and then biting into the soft and succulent chicken, I realised that the smell was only a fraction of the immense flavour packed into this dish. The dried sweet basil was also a pleasant surprise, typically it is dried seaweed in a dish like this, but the dried sweet basil was crispy and full of salty goodness. The only questionable factor of this dish was that the sweet basil taste was not very strong and hence made the title feel a little misleading. Even after the dish had gotten cold it retained its crispiness and moistness, and when the next table ordered the same dish and I smelt it again my hunger definitely returned. 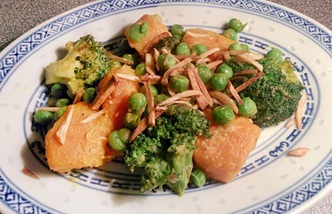 The last dish to happily arrive was the Pumpkin, broccoli and green peas, a dish that I would recommend you order for your most vegetable-hating friend to convert them into a veritable vegetable-lover. The only dish I know that typically uses salted duck egg yolk is with prawns – this was during a period when my mother cooked this solidly for an entire month until she gave up on perfecting it. From that experience, I learnt that balancing the main ingredient and the salty richness of the duck egg yolk is an apparently complicated experiment. The dish honestly doesn’t look like much, but it’s definitely another one that you feel rather empty and despondent when you realise it’s finished and you find yourself staring at the bottom of the blue-patterned dish. The pumpkin hadn’t quite soaked up all the flavours, but the broccoli was a definite winner, with the egg yolk burrowing deep into its flowery head. The green peas were also a delight that reminded me of wasabi peas, minus the spiciness. Being a slight traditionalist with my desserts, I was prepared to not enjoy the two desserts on the menu, Tang yuan (taro sticky rice balls with ice cream, ginger biscuit, peanut brittles) and Panda cotta (black sesame panna cotta with blackcurrant jam and lemon sorbet) . Again, I was proven wrong. 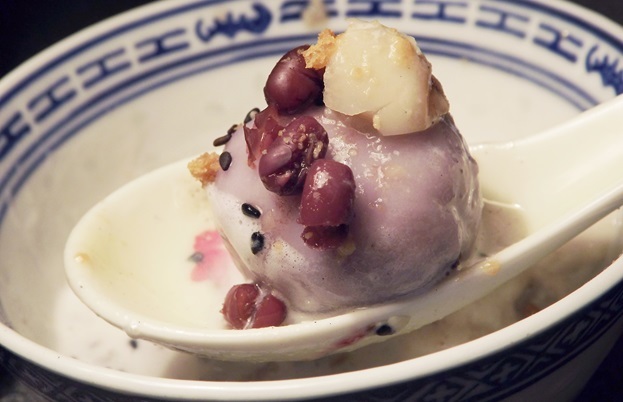 Tang yuan are balls of chewy glutinous rice flour that can be plain or filled. 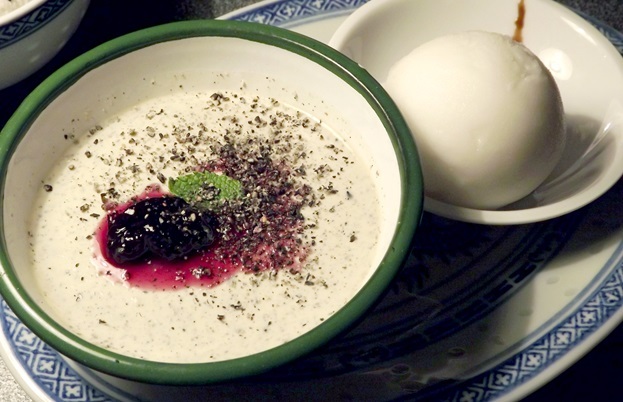 Although the tang yuan skin was relatively thick compared to the standard recipe, the texture this created was good and the taro filling once again had a comforting subtleness. The sweet ice cream complimented the heaviness of the balls, although it might have been nicer if the ginger and peanut brittle taste cut through a little more. Apart from sporting the quirky name of Panda cotta, the recipe was clearly well thought out. When you put it in your mouth, you first experience the creamy richness of a typical panna cotta, but then as that melts away, the sesame taste emerges and lingers in the mouth. To accompany this, the chef had added a cool and refreshing sour lemon sorbet which balanced the richness of the panna cotta, much like the tofu did with the century eggs. Overall, I think that Chinese Laundry has an interesting menu that would suit a wide audience and introduce many people to some of the lesser known dishes in Chinese cuisine; I would definitely return to share with more people the intimate environment, subtle dishes and unique drinks served up here.